Tatiana Ostanina is coaching Nejib Belhedi in his unprecedented World Iron Swims throughout Tunisia. Belhedi started off small, pulling a skiff, and has gradually and dramatically increased the size and weight of the boats he has been pulling. His latest World Iron Swim boat pull on April 19th will be filmed by AJ+ Aljazeera TV. "The shooting coincides perfectly with my period of programmed preparation at his usual training base in the Hammamet Gulf near the Hammamet Garden Hotel in a wonderful sea venue where I am supported by Tatiana Ostanina of Russia." Coach Ostanina works with Belhedi to fully develop his mental and physical capabilities. "There is a fine line between reality and mythical. We are working with Nejib to 'extract' the biggest and heaviest ship of his World Iron Swim series. 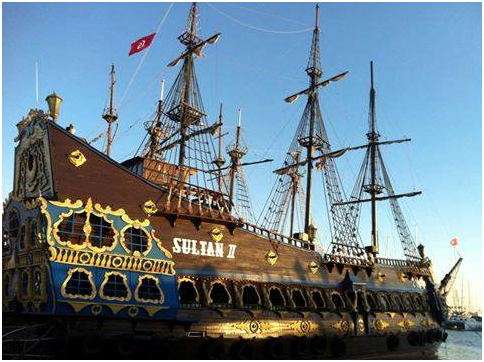 The SONATRAK weighs more than 1000 tons, on May 22nd in the Commercial Port of Sfax. The verb "to extract" is more expressive than to pull or to move or to tow because it gives the sense that the ship is completely immobile and stopped at the start and Nejib will have to move it from its mooring." Belhedi received the support and encouragement from Governor Mnaouer Ouertani of Nabeul, Commissary of Tourism of Nabeul Wahid Ben Youssef, Director of Yasmine Hammamet Port Imed Mzoughi, Commercial Director of Hammamet Garden Hotel Nedra Boujbel, and General President Director of Hammamet Garden Hotel Jamil Boujbel. The program called Belhedi, The Tamer of Ships will be broadcast by AJ+ Aljazeera TV. Photo above shows the Sultan II that Belhedi will extract from a dead stop without the aid of currents, tides or waves in April.